Who would have thought – a wine cooler and cigars could make such a perfect match? 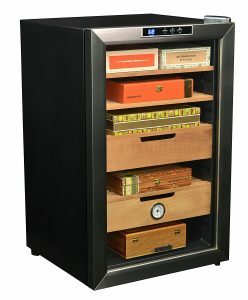 Well, ahem, let me introduce you to the cigar cooler or as some call it the wineador. If you think about, it makes so much sense why it’s a match made in heaven, right? On one hand, cigars rely on steady temperature and humidity and on the other, wine coolers have become much more reasonable and easy to setup in the home. We are talking about a 20 minute setup from package to plugging in! Wineadors are a very reliable way to protect your cigar investment by giving you peace of mind that your cigars are stored under the perfect conditions. Don’t put those precious new cigars at risk. This guide will help you learn more about cigar coolers, or wineadors. From preparation, seasoning, and ownership tips, to reviewing different cigar coolers – we provide you with everything you need. Wineadors are a great way for cigar aficionados to ensure that the temperature and humidity is much more controlled. 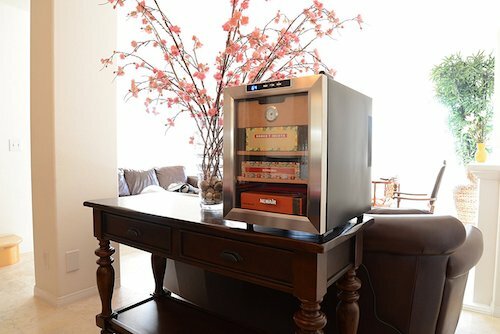 If you live in an area with particularly high humidity or heat, you may be in the market for a wineador. For many cigar coolers, you can simply press a button to have your temperature adjusted. That’s a heck of a lot cheaper and easier than keeping your air conditioning running for peace of mind that your cigar collection isn’t fried. Wine coolers are also great humidors due to many of them having an internal fan to help with air circulation. Cigars need air circulation, plain and simple, and without it, your expensive cigars may become dried out and brittle. A fan in a wineador helps make sure that the humidity is evenly dispersed throughout the cooler. No more having to remember to open your humidor up every few weeks! Lastly, aside from superior control of temperature and humidity, the wineadors look super sleek as well. 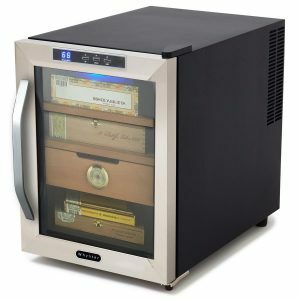 For a wineador, you can use purchase cigar coolers and wine coolers from popular brand names like Whynter, Frigidaire, New-Air and many more. Fortunately, I have taken a look at many of these cigar coolers personally and reviewed them below to help you pick the right wineador for your cigar collection. Wineadors are a great way to store a larger collection of cigars – normally anywhere from 50 to +400 cigars. However, as you may have experienced, sometimes your collection grows faster than you anticipate, so it’s certainly not a requirement. (My personal collection certainly fills up way too fast!). There are many different sizes for coolers, so check out the specs and reviews below to figure out what size you may need along with estimates of how many cigars to place in them. One of the most important aspects of owning a wine cooler is the placement of the device. A lot of people make the mistake of placing the device near a heater or source of natural light. This will naturally impact it’s effectiveness. I personally had my wine cooler next to a glass door and as the sun would set, my wine cooler would struggle to keep cool for a few hours a day. It certainly took me a while to figure that one out. 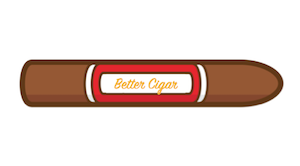 Be sure to check out the dimensions below in our cigar cooler reviews. This will help ensure you have a nice spot picked out for your new wineador before it arrives. The golden rule is have both your humidity and temperature to stay within the 60 – 70 range. As you develop a better idea of what humidity and temperature is best for you, you can adjust easily with a wineador. It’s all about personal preference. I personally like to keep my humidor at 70 degrees and 67% humidity. Lastly, it’s always a good idea to calibrate your cigar cooler after seasoning. It’s recommended to purchase a separate digital hygrometer along with your cooler to make sure the readings of temperature and humidity match up. This is a good practice with humidors in general. Many recommend doing this recalibration once a year as digital hygrometers can become iffy after a while. Check out our guide by clicking here to find the best digital hygrometer for your cigar humidor if you don’t have on yet. Once your hygrometer is calibrated and wineador is seasoned, slowly start introducing your cigars 10 – 20 or so at a time every day or so to make sure your temperature and humidity can adjust accordingly. Humidification in a wineador is not much different than humidification in all other cigar humidors. However, it is strongly recommended that you use a two-way humidification method. For example, Boveda packs, Xikar beads, Heartfelt beads or similar product. Two-way humidification makes sure things don’t get too wet or too dry rather than overdoing it one way or another. For a more high-end option, a lot of cigar aficionados recommend the Cigar Oasis Excel. This electronic humidor plugs in and the flat cord flawlessly fits in the door without breaking the seal. I initially started with Boveda 70% packs and typically had to replace them monthly but finally got a Cigar Oasis Excel that only needed refilled every 4 months or so. You will know if you need to replace the Boveda packs once they get a bit stiff. Buy a cigar cooler that includes nearly every aspect of what you need. These are specifically made for cigars and typically come with 2-4 cedar shelves and a hygrometer to measure humidity. All you need to worry about is humidification. Buy a wine cooler and convert it to a wineador with cedar shelves, a hygrometer and the proper humidification device. This process requires varying degrees of elbow grease depending on the model. In my personal experience, it’s much easier to buy a ready-made cigar cooler. However, I want to share both options for those of you out there who enjoy a challenge. I have done both and building your own can be rewarding but this is one of those things I prefer just to plug and go. I am hoping to create a guide on how to build your own in the near future. That being said, now that you know a lot about cigar coolers, here are our reviews and recommendations for the best cigar coolers of 2017. Easy Humidification – Although you can use a electronic humidor with this unit, you can certainly get by with other cheaper forms of humidification due to the small size. Xikar humidification beads or 3-5 Boveda packs work great. Functionality – The LCD screen is a must, giving you a constant read of temperature and the ability to make adjustments on the fly with just a push of a button. The LCD screen is bright and easy to see. The unit also is exceptionally quiet, and vibration free. Compact Size – This compact unit can go almost anywhere – perfect for an office or living room. Can easily go on the ground nestled next to the bar or on top of a cabinet to blend in. Lack of Capacity – It is a bit small capacity wise – it’s nice to have a compact unit that can go pretty much anywhere but cigar collections can grow fast. Hygrometer Accuracy – There have been some reports of the hygrometer not being reliable, which is common with most inclusive hygrometers. We would highly recommend upgrading to a digital hygrometer to be 100% sure of your humidity. Lower Temperature Capability – The temperature on this unit only gets up to 66 degrees. Although definitely okay for cigar storage, if you prefer to have your cigars at higher temperature then keep reading. This is an all-around great unit especially for cigar lovers who are just now getting serious about protecting their cigar collection. Many of the downfalls of this unit can easily be prevented by following some of our tips above. If you need a bit more space for your collection, check out the Whynter 250-CS. It has all the same great features with 2 more cedar shelves, 1 more drawer to hold up to 400 cigars. Appearance – There’s no doubt about it, the New Air CC-300 cigar cooler is also very good looking. Stainless steel door with black exterior and a few more cedar shelves and drawers than most models for maximum storage. Temperature Capability – You can set the temperature up to 74 degrees, unlike other models out there that only get up to the mid-60’s. This is especially useful if you like your cigars to have a bit more of a draw. Cigar Capacity – Even if you don’t have 400 cigars in your collection, this unit is nice and spacious to allow you to strike when the iron is hot with the next online cigar sale. Perfect for a few CAO Amazon Basin boxes! Hygrometer Accuracy – This is another model that has a hygrometer that you will likely want to replace with a digital hygrometer to ensure your cigars are at the proper humidity. Remember, these companies make wine coolers, not cigars so you have to give them a break. Lack of Lighting – It’s best to set this unit up in an area with a lot of ambient light or near a lamp. The interior blue LED is not bright enough to adequately search for cigars when opened. Great for looks but not for trying to find that stick in the back of your collection. 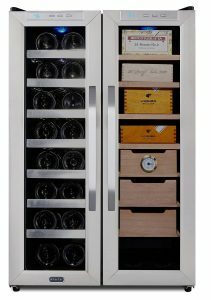 If you would like to step your game up or start with a little more space for your collection to grow into it’s own, this is the wine cooler for you. More flexibility around temperature as well as the additional cedar shelves and drawer makes this one a winner. The biggest downside is a lack of lighting but that can be fixed with proper placement of the unit, or simply slap an LED light strip inside of it. Appearance – If you are really looking to knock the socks off of anyone who may see your cigar collection before even seeing any tobacco than this will do it. The unit has two separated sections, one for 16 wine bottles, the other for cigars. This unit has a brushed stainless steel door and black exterior, similar to other units. Wine & Cigar Capability – Whether you like drinking wine or a nice chilled glass of bourbon, you can store it all right next to your cigars. This unit has separated, individually temperature controlled compartments. The wife may be a little more accepting of this one! Price – For one of the best wine coolers on the market, you are obviously going to have to pay top dollar. It is on the higher end in terms of price vs. the other units but it’s by far and away the best option on the market right now that we’ve seen for cigar coolers. Interface – This is a bit nit-picky but I like being able to see the temperature readouts a little more clearly than this unit. Often times I find it hard to see it unless I am right in front of the unit. The Whynter CWC-3511 is a bit deceiving in photos, it looks quite a bit bigger than a foot and a half but it’s plenty big enough for your favorite beverage and cigar combinations. 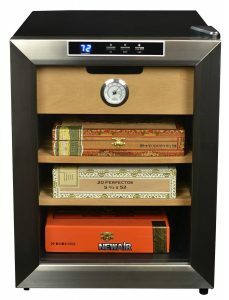 The space combined with the ability to control the temperature on both your wine and cigars in one unit makes things easy breezy. It’s hard to find much wrong with this cigar cooler – if you have the means, then we would highly recommend it. There are a couple other units out there but these are the very best cigar coolers. Honestly, it’s hard to find a lot wrong with any of these. A cigar humidor is not a complicated device. By following this guide, you will ensure that your cigar cooler will maintain humidity by being setup and maintained properly. We hope this guide was helpful in picking a wineador that is right for you. Please let us know if you have any questions or have found any great wine coolers that we should review.